GUIDE TO NETWORK DEFENSE AND COUNTERMEASURES provides a thorough guide to perimeter defense fundamentals, including intrusion detection and firewalls. This trusted text also covers more advanced topics such as security policies, network address translation (NAT), packet filtering and analysis, proxy servers, virtual private networks (VPN), and network traffic signatures. Thoroughly updated, the new third edition reflects the latest technology, trends, and techniques including virtualization, VMware, IPv6, and ICMPv6 structure, making it easier for current and aspiring professionals to stay on the cutting edge and one step ahead of potential security threats. A clear writing style and numerous screenshots and illustrations make even complex technical material easier to understand, while tips, activities, and projects throughout the text allow you to hone your skills by applying what you learn. 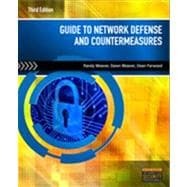 Perfect for students and professionals alike in this high-demand, fast-growing field, GUIDE TO NETWORK DEFENSE AND COUNTERMEASURES, Third Edition, is a must-have resource for success as a network security professional.